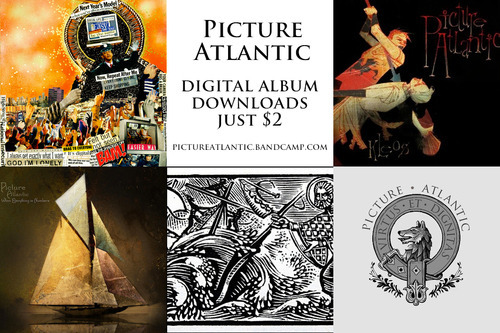 Take a break from all of your crazy Amazon.com lightning deals and pick up any Picture Atlantic release on digital download for just $2 at our Bandcamp page. This includes our two full-length albums and three EPs. Our two Christmas tracks are available to download for free while we work on the 2013 song and you can get them here. We’re also offering our PA Wolf T-Shirts for $5 and Wolf Polos for $10 on our online store. All of these sales will go directly toward funding our third full-length album which we’ll continue demoing this month. Thank you for your love and support. We are excited to unveil another new song at Slim’s on the 23rd!